If you decide to take part in an outdoor activity, fishing is one of the options to consider as it’s ideal for adults and children alike. You don’t have to be a seasoned angler to enjoy this activity. With the right gear and equipment, fishing can be a rewarding activity. 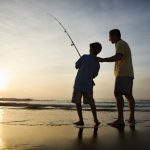 If you have not introduced fishing to your kids yet, now is the time to teach them this exciting hobby. There are several ways you can make this sports something your kids will look forward to. If you intend to make fishing more fun for your new angler, choosing an ideal location is key. Be sure to choose an accessible location. Your children may not enjoy fishing if they become tired of walking. Fishing takes your children’s attention away from the ever-present electronic devices of today’s world. When introducing fishing to your children, be sure to get a spot where there’s plenty of fish. Children can’t wait too long for the fish to bite the bait. You can keep them excited if you choose a location and target species that are less likely to keep them waiting long. As much as possible, fishing shouldn’t be a tiring activity for your little ones. While it’s filled with fun, your child may not appreciate it at first. Once they get distracted, they will start running and you’ll have a hard time getting their attention. If you are introducing fishing to a pre-schooler, it might be best to time your fishing trip. The length of time will be determined based on your child’s age. The younger they are, the less time required. If you are taking a preschooler, you might have a hard time making them sit still. They also tend to fidget all over the place making it more difficult for you to make them pay attention. There are fishing rods and tackle designed for children. They are specially made for little anglers as they have short rods and usually display child-friendly characters. Since your preschoolers have small hands, short rod reduces the possibility of making them frustrated. While small hands can’t cast the line yet, you can consider casting for your child and give them the rod afterward. Another way to do it is to attach the sinker so it will be easier for your preschooler to release the line into the water. Be sure to prepare a list of fishing essentials like lifejackets, first-aid kit, sunscreen, food, water, and a camera. You may also bring a few surprises to keep your kids occupied while waiting for the fish. Keeping kids entertained will prevent them from getting bored. Children should wear life jackets when on the water to ensure safety. Fishing is a fun activity for children if you educate them about these creatures. Take time to read books about fish with your child to develop their interest and to have a basic idea about how fish behaves. You may also teach them the basics of fishing so they will know when to catch and release. Make the activity as fun as possible so your kids can enjoy your time together.